Contrary to the market's opinion, CenturyLink and Pattern Energy look like great buys to this investor. If you bought this time last year, Centurylink Inc. (NYSE:CTL) and Pattern Energy Group Inc. (NASDAQ:PEGI) haven't exactly been great investments, with share prices down 33% and 19%, respectively, while the S&P 500 (SNPINDEX:^GSPC) has gained 15%. Even when we factor in dividends, they lost investors money while the market delivered more than 17% in total returns. And while it's important to remember that stocks can be volatile over the short term, it's not fun watching your stocks lose value while the market goes up so much. But sometimes where the market sees weakness, there's actually opportunity. And I think that's the case with both of these stocks today. Betting against the market can be risky, but there's often greater reward. Image source: Getty Images. First, you have a company paying a dividend that's far too big to sustain, based on earnings and dividends paid. CTL Total Dividends Paid (TTM) data by YCharts. Management expects free cash flow of $3.25 billion at the midpoint (of 2018 guidance), which is more than adequate to service the estimated $2.3 billion in dividends. While it's important to note that this figure includes net operating loss carry-forwards, reducing taxes paid for the next several years, the recently enacted Tax Cuts and Jobs Act will significantly lower tax bills afterward. But there's a second part of the bear thesis that this doesn't address: the decline of residential cable and telephone lines, as evidenced by the struggles of peers Windstream and Frontier Communications. After the Level 3 Communications acquisition, Centurylink is far more reliant on enterprise customers, generating almost 80% of its revenue from businesses. Furthermore, the bulk of its residential customers are for broadband services, which is a stable -- and growing -- business. The takeaway for me is similar to my more bullish colleague: The shorts see a legacy business in decline, and are ignoring the substantial cash flows the company is set to generate, as well as its potential to grow enterprise and broadband consumer businesses, while still supporting a substantial dividend. 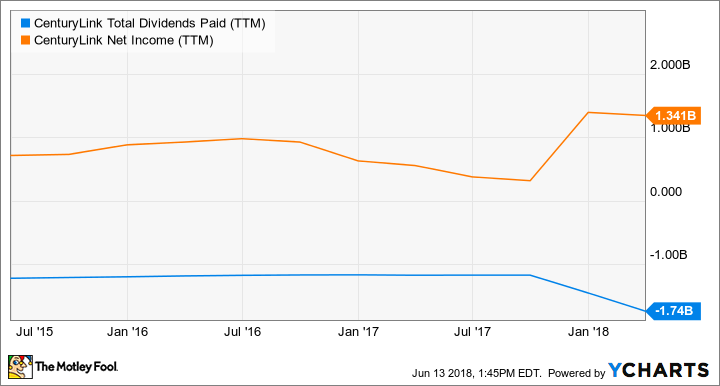 While it's not a risk-free dividend -- management could always reverse course and cut the dividend to accelerate debt reduction or share buybacks -- I think the total return profile it offers is greater than the risk of a cut. To some extent it looks like even the short-sellers are starting to figure this out. Since last October, the number of Centurylink shares held short has fallen almost 30%. Like Centurylink, renewable energy producer Pattern Energy has a substantial amount of money betting against it. 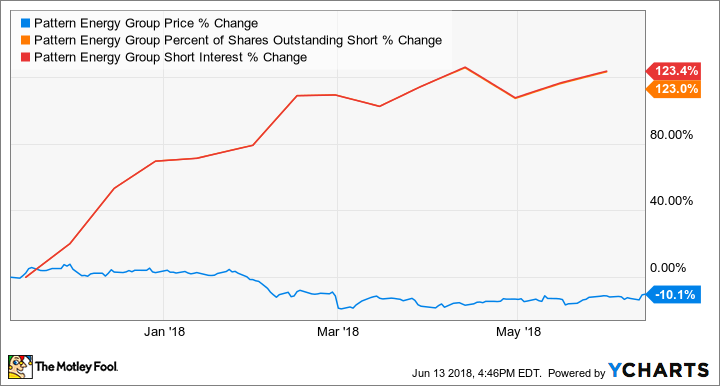 But while shorts have started backing away from Centurylink, Pattern shares held short has increased by more than double over the past seven months. Pattern is in a wonderful long-term growth industry, but investors are betting against this company's ability to generate growth at least in the near term, and betting that this will affect its cash flows enough to put the dividend at risk. There is some risk investors should be aware of. The new federal tax law enacted this year made some changes to so-called "tax equity investments," which is a substantial source of capital for renewable energy project development. The short version is that some companies that previously utilized this mechanism to reduce taxes may no longer be able to. This has affected funding for many renewables projects in the U.S. during the first half of 2018. Furthermore, rising interest rates have also become a concern for Pattern, which uses a substantial amount of debt to fund projects. As rates move higher, it could be harder for the company to generate the same rates of return on its energy producing assets -- or at least that's the fear. But by my estimation, the market is seeing too much risk and missing out on the opportunity. Pattern Energy has an experienced, successful CEO in Mike Garland, who has been developing wind projects for many years. His experience across varied regulatory, interest rate, and economic cycles should prove incredibly valuable in the years to come. The company's recent move to sell its operations in Chile is a great example of Garland's savvy. Pattern sold its stake in the El Arrayan wind project for a premium to the CAFD -- cash available for distribution -- multiple the company has often paid to buy other assets. This move, which will raise $67 million, was also strategic in nature. Its Chilean operations were geographically remote from its other operations, making it more expensive to manage. Not only did it sell at a premium price, but it should also be able to reinvest that capital in assets that generate higher returns while costing it less to manage. That kind of capital allocation skill should serve Pattern and its investors incredibly well. As demand for low-cost wind, solar, and energy storage continues to grow in the years ahead, the company should deliver market-beating returns over the long term. But be prepared to ride out some turbulence in the short term.